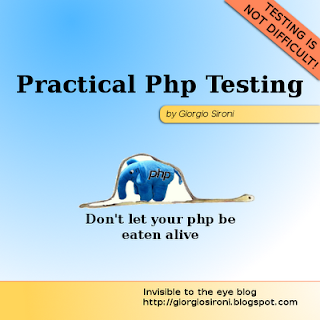 Here are my "slides" for the (Italian) talk I held at PHP.TO.START this week. It has been nice to meet so passionate colleagues in Turin, not only from the PHP field but also in the startup arena. If I can't find you and you see this, comment here or ping me on Twitter so that I can follow you. The talk's topic is the evolution of testing in PHP - from manual to automatic and from a scope oriented to correctness to an aid in design. Here are my original articles published this week on DZone. PHP objects in MongoDB with Doctrine contains code for working with the Doctrine Object-Document Mapper and for integrating it with the ORM. TravisCI Intro and PHP Example shows you how to setup an open source project to build itself on Travis CI (for free). Sometimes Python is magic because of its __methods. A Zend Framework 2 tryout is my review of the Zend Framework 2 beta releases, along with a list of what you don't have to learn again for now. Asynchronous and negative testing is about testing that something does not happen in a running system. Everything you need to know about Python exceptions is about the try..except..else..finally construct and the exception hierarchy of Python. All about JMS messages topic's is a must-know for working with ActiveMQ and similar message-based middleware - I know middleware sounds like a buzzword, but I assure you it has a specific meaning. Bootstrap: rapid development and the complexity of a framework is my review of Bootstrap, a front end framework shipping some standard CSS solutions and UI widgets. Test-Driven Emergent Design vs. Analysis is an essay about the dichotomy between writing code with the support of tests and exploring new classes and objects via other fluffy means like paper and boards. You know, that old thing called thinking. PHP Goes Mobile has been rescheduled for April 13th in Milan; I will present my short talk on PHPUnit_Selenium usage on an Android device. See you there! TDD in Python in 5 minutes is a dive into the unittest Python module. Gradient descent in Octave is a walkthrough in a staple machine learning technique.